TEHRAN, Iran-- Tehran resident Sousan Heidari has stopped letting her headscarf slip casually down over her neck and shoulders while driving in the Iranian capital. These days, the 22-year-old with a taste for bold makeup makes sure to pull it tightly over her dark hair, fearful of running afoul of a newly established undercover division of the morality police. Tehran police chief Gen. Hossein Sajedinia recently announced his department had deployed 7,000 male and female officers for a new plainclothes division - the largest such undercover assignment in memory. 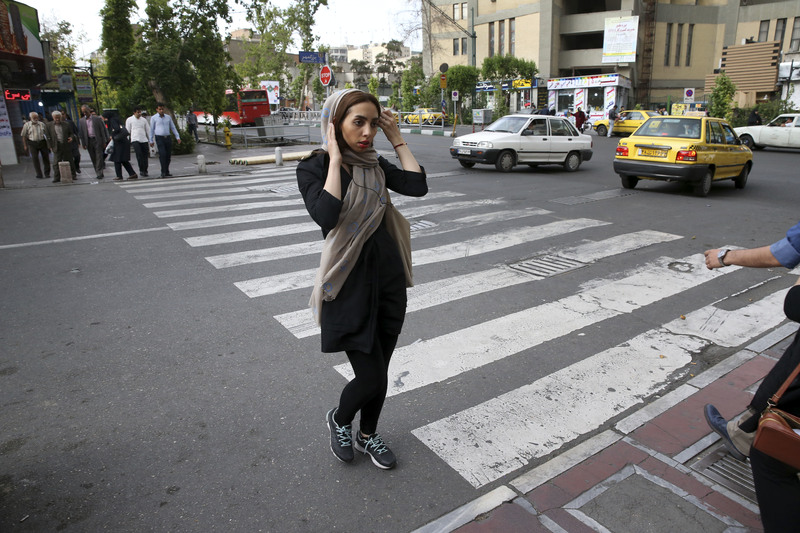 Authorities say the division, which started work last week, will patrol major Tehran streets and intersections, policing transgressions including harassment against women and excessive car honking and engine noise. Critics fear the unit's main focus, however, will be enforcing the government-mandated Islamic dress code, which requires women be modestly covered from head to toe. They see it as the latest flashpoint in the struggle between relative moderates such as President Hassan Rouhani and establishment hard-liners who fear looser social norms will weaken the Islamic Republic's values and priciples. Influential ayatollah Mohammad Ali Movahedi Kermani alluded to those concerns about moral erosion during a recent Friday sermon in Tehran, saying that a woman driving without a veil, "cannot be called freedom." Shahindokht Molaverdi, vice president for women and family affairs, criticized the decision and expressed concern that it would be "limited to giving warnings to women over improper attire," according to local media reports. They have found support from hard-liners, including female parliamentarian Fatemeh Rahbar - who said the previous practice of uniformed morality police was too easy for violators to spot and evade. On Sunday, the spokesman of the hard-line dominated judiciary, Gholam Hossein Mohseni Ejehi, added his voice of support, saying the "judiciary definitely supports the police plan to confront open social corruption." Tehran-based political analyst Saeed Leilaz believes the new unit is a reaction to the resounding defeat of hard-line and conservative candidates in Tehran during recent parliamentary elections. A bloc led by moderates and reformists won a majority of seats around the country, but captured all 30 seats representing the capital in the 290-seat parliament. A runoff election for 68 remaining undecided seats will be held Friday.